The future can only be predicted by computer climate models. 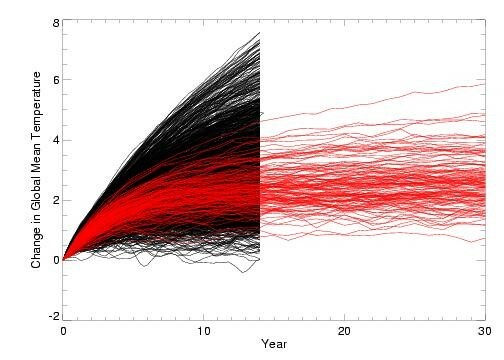 The most accepted of these are the IPCC results which simulate climate change over 30 years (the red lines on the graph below). 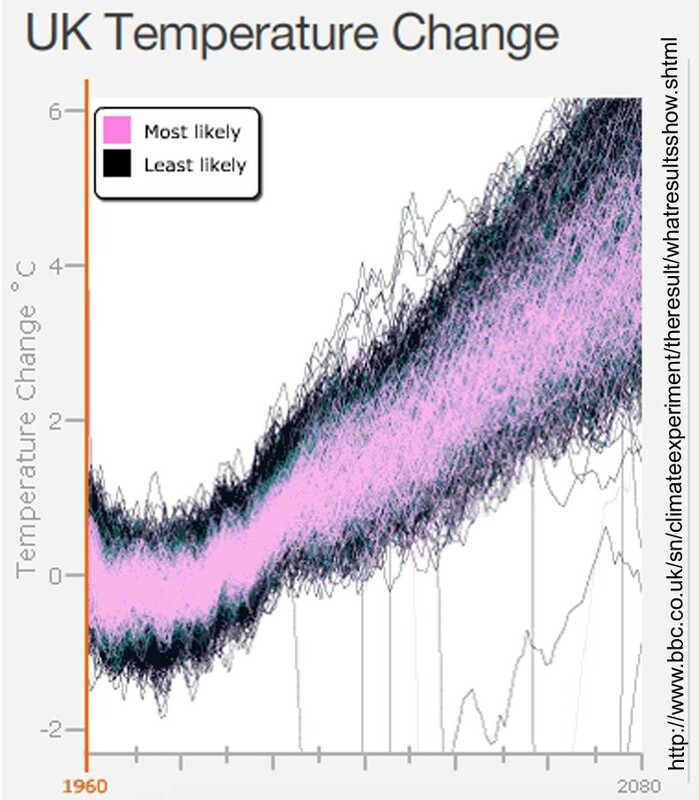 Other models, such as those from www.climateprediction.net (in black on the graph on the right) run by thousands of individuals on their home computers, are investigating simpler models, but looking at how sensitive the factors are which interact. The results from this model (2005) show that climate is likely to heat by 4 Centigrade, but could heat by as much as 7.5 degrees – much more than the IPCC or Hadley Centre models. Each of the lines on the graph is a single run of a model on a computer. Each run has a slightly different idea of how the oceans and atmosphere mix, and how they interact. By trying a wide range of runs, a good idea of our likely future can be obtained. Click on the graph for more info. The ‘0’ on the ‘Year’ axis is now. Full results are at the BBC results page. In essence, this refines the previous simulations by including interactions with oceans and with solar variation. The solar variation did not have much effect – and so is not a vital driver for climate change on this timescale. By 2050, a target date in many UK and EU plans for emission reductions, the UK average temperature will have risen by about 2.4 degrees Centigrade. This is greater than the EU target for world temperature rise, of 2 Centigrade. By 2080, average UK temperature could have risen by 3.8 Centigrade, with a possible range from 1.8 to 7.0 Centigrade. These are extremely rapid rises in geological terms.